Dehong factory has been producing this Pu-erh brick for a long time, it is one of the chief exports of CNNP before 2005. 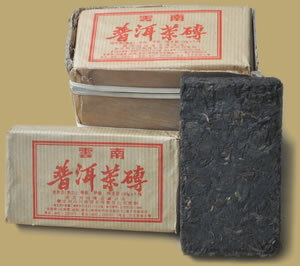 Five Pu-erh tea bricks stack, weighs about 100 grams each, wrapped in plain brown wrapper. The tea has an agreeable mellow character and the earthy flavor that is common to Pu-erh tea. Excellent for drinking immediately.